Mozilla released Firefox Quantum on November 14, 2017. Firefox Quantum is just a another name for Firefox version 57. It comes with the new Servo rendering engine written in the Rust programming language, Stylo Quantum CSS engine, Multi-Process support, Screenshots, WebExtensions, WebAssembly and WebVR support and with new Photon Design theme for its UI.Firefox Quantum is now 2 times faster as compared to previous versions of Firefox. The default value is true, just double click on the toolkit.cosmeticAnimations.enabled option or right click and select toggle. It will turn off all the animations on your Firefox browser. This new Photo design theme adds search box in your firefox Preferences option page (setting page). If you dont like this then you can remove it by going to about:config page. Double click on the browser.preferences.search option or right click on the browser.preferences.search option and select toggle menu to remove the Preferences Search Box from you firefox browser. Pocket is mozilla’s read-it-later service, which is now deeply integrated with the new firefox. 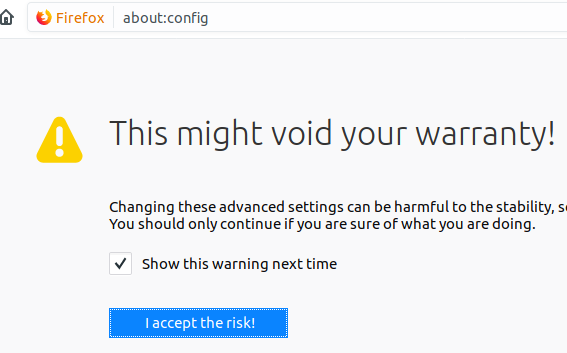 To disable all Pocket features your need to go firefox’s about:config page in firefox. Type and enter the below url in firefox. And double click on extensions.pocket.enabled option. That’s all.